A few months back I decided that I needed a red bag in my life and I was dead set on adding something Saint Laurent to my ever-expanding collection of bags. I'm all for mini bags these days as they not only fit into my personal style, but also my lifestyle really well. 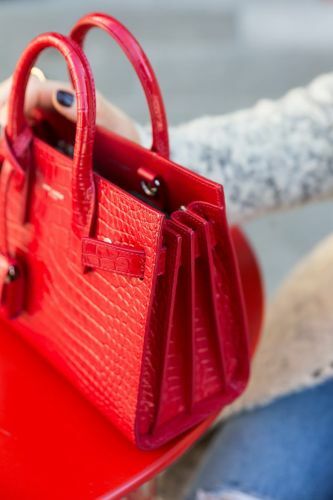 Saint Laurent does red really, really well but even still I couldn't decide which bag I wanted to make mine. You guys certainly had a lot to say, but in true Kaitlin form I went in to try them on not once, not twice, but I think three, or maybe even four, times. On my final try I ended up in Neiman Marcus and left even more confused when the Sales Associate suggested I try the Céline Nano Luggage Tote in lipstick red since it had a top zip-unlike the Sac de Jour. Luckily I didn't make any rash decisions, but rather I went home and gave it some thought. Actually, I gave it a lot of thought.